WOULD YOU LIKE TO STUDY ENGLISH IN CALIFORNIA? JOIN OUR INTENSIVE ENGLISH PROGRAM! Cerritos College is an accredited two-year community college that offers a full-time Intensive English Program (IEP) where you can develop the language skills you need and be prepared to study and earn college credit at our college or any other college/university in the U.S. It is also for individuals who may already have their degree or may not want to transfer to the credit side, but are wanting to improve their English language skills. Our program and campus is a student-centered environment where you will be fully immersed into the English language and culture. Our program and campus is a student-centered environment where you will be fully immersed into the English language and culture. Our top notch faculty and staff are dedicated to making your learning and cultural experience rewarding. Our Intensive English Program is 16 weeks (4 months) and will provide you over 320 hours of Intensive English language training. Upon entering the program, you will be assessed and then will be assigned into a group (level 1 or level 2). We will meet Monday through Thursday and you will get instruction customized to your level – we will take you from where you are at with the English language and help you to effectively learn quickly how to improve your writing, reading, grammar and speaking abilities. You will also be provided other opportunities outside of the classroom to practice what you are learning, such as field trips and conversation time with American students. Throughout your time at Cerritos College, you’ll get personalized attention and support. Our class sizes are small, so that you get individualized help from your teachers. The International Student Center staff and the Community Education staff is here for you from the moment you apply through the completion of the program and after - We will be with you every step of the way! Upon successful completion of the IEP, you can transition into your major field of study at Cerritos College, or transfer to any other college or university you choose to attend. 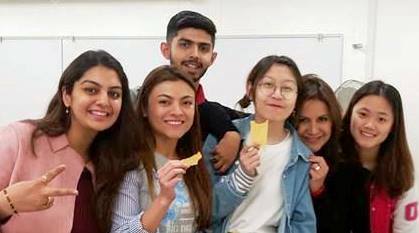 Cerritos College has a very high transfer rate of its international students - our graduates transfer to top universities such as UCLA, USC, UCI, UC Berkeley, Cal State Long Beach and many more. • Certificate upon completion of the program. HAVE MORE QUESTIONS OR WANT MORE INFORMATION ABOUT APPLYING? Please read: FIRST DAY ORIENTATION: IEP will begin with an orientation on your first day of the program. Your orientation will include an overview of the IEP, meeting of your instructors and other important people you'll need to know, a writing assessment, campus tour, getting your student ID, etc. You'll have a lunch break, then will finish up the day by taking your multiple choice assessment test in the assessment center. And do not worry about the writing assessment and this assessment test - they are just to help us put you in the right level in this IEP program (level 1 or level 2). But whatever level you are at, we will help you progress in your English proficiency.